Iori Mikumo is a regular artist of Daidogei World Cup in Shizuoka for many years. Even more he has been performing the very special programm for only this festival since 2009. 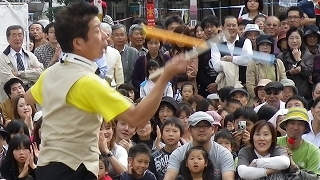 He is an amiable artist and has genuine skills of juggling. The thing that is amazing about him is that he can make everyone laugh, when he can not do well. Everyone got drawn into "the MIKUMO world". "Please give us some words for the 20th anniversary?" "I look forward to being here in the 30th anniversary as well." he told with us in a friendly talk. 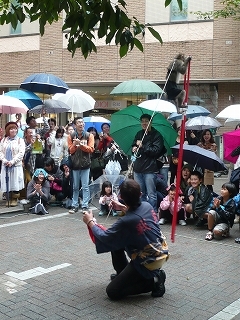 There are so many people who are waiting for their performance in the rain. Then a Japanese guy is coming with a cute monkey. It's time for monkey entertainment. It's been 3 years since Sora teamed up with a very cute and funny monkey named Mame. 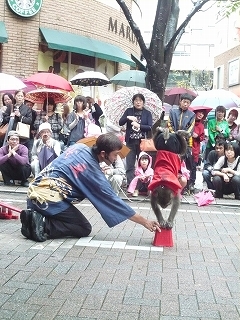 Their master is the famous monkey entertainer "Taro and Jiro". 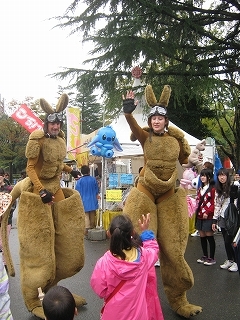 This is the first time for them to participate in this festival. When they are doing their show, they look like really nice friends. "Although we are partner, confirming who is stronger and better is very important for monkey. So I have to show him that I'm his boss." It looks like the monkey world is not that easy. Neverthless ,during the performance, their teamwork is just amazing. Unfortunately we might not be able to see their performance this year in Shizuoka. But I do hope we can meet them again next year!! A tall and stylish man is standing at the point which is next to the Shizuoka station. His name is Tempei who has not only won the Japanese cup this year in this festival but also won a lot of awards in the world. 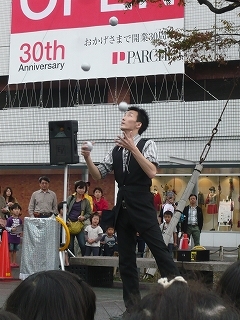 He is a professional juggler. What makes his performance unique is that he barely speaks words during the performance. 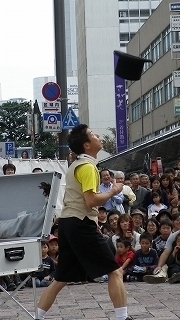 His strength is his skills and qualities of juggling. Even if he does't say a word, he can glab the audience's attention enough. "The Daidogei World Cup is great. 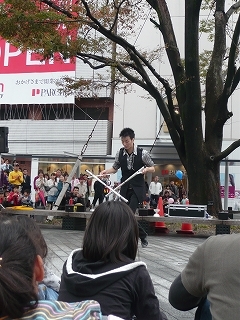 People come to enjoy this festival and I can feel the reaction of the audience at close hand, which is really nice for performers. That's the difference between the performance in a theatre and the one on the street. Moreover, we have to think about stage direction, illumination and everything by ourself when we are performing on a street. So when I complete the show like this I can feel a great sense of achievement, which is amazing and make me excited." His juggling harmonizes with the music he chose, His juggling skill is just astonishing. I wouldn't be surprised that he could win the Japanese cup. His next target is the world cup champion. Today is the last day of the daidogei world cup. I do hope that we can watch his performance in Shizuoka again next year!! 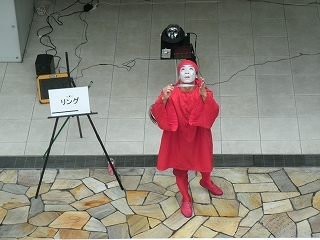 Have you seen the performer with a red strange costume and white makeup, Kamimaro? About his appearance,「I want to look like something, not human... 」He says. Just by him going on to the stage, the place is wrapped with such a mystrious atmosphere. He shows you various magics using usual items such as Playing cards, Rubber bands, Can of coke, Rings and Paper. Especially you will love the paper magic 「A story of a tiny life」at the climax of the show. It is his third year in the DAIDOGEI World Cup in Shizuoka this year, but he loves this city and is so looking forward to perform in front of you again next year. Have you ever seen G-nyo's performance? I'm sure you'll be smile if you see that. 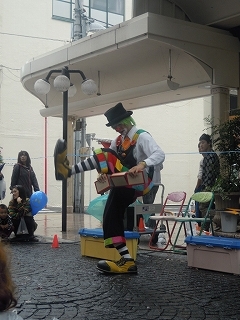 He is a clown wearing colorful costume, and having a cute smile. He shows you many kind of performance. For example, making animals with ballons, juggling with balls, and balancing chairs on his forehead. He was named G-nyo after a football player Ronaldinho. He said "becouse Ronaldinho looks like he is having a lot of fun during a game"
Actually, he really enjoys performing. 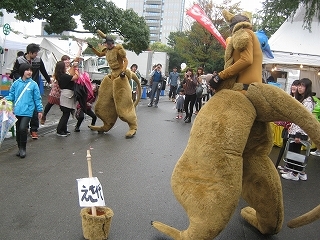 Wild pair of kangaroos on the loose! barragging into the opening ceremony for the Sydney Olympics. out of the pouch to give a friendly greeting. to spread the love and joy. surely be happy to hop around in joy!